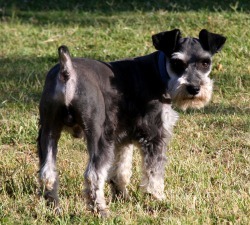 Max is a 10-pound black and silver male Mini Schnauzer. He is AKC registered and very square and solid. Max was raised in our home and stole our hearts when he was just a puppy. He has always had so much personality! Our kids call him "The Hopper" because of the way he bounces around at your feet when you walk with him outside. No one is more excited to see a friend than Max is! In spite of his exuburence, he is always very gentle, even with young children. He loves to be held in your lap and have his chin rubbed. What a character!